This is not a skoolie question per se but I was hoping someone here might have some answers for me on this. I moonlight as a party bus chauffeur for a tiny limo company in a small college town. I was hired because he has another bus and another driver already but he is getting popular and needed to add another bus (before you ask, yes he is legit for hire, buses are registered and insured as CMVs with USDOT#, and we have CDL-P's). So basically he went cheap and dirty on the second bus, he said he spent about $1500 on it. He did up the interior nicely, and during the off season we will be doing some more upgrades as well. 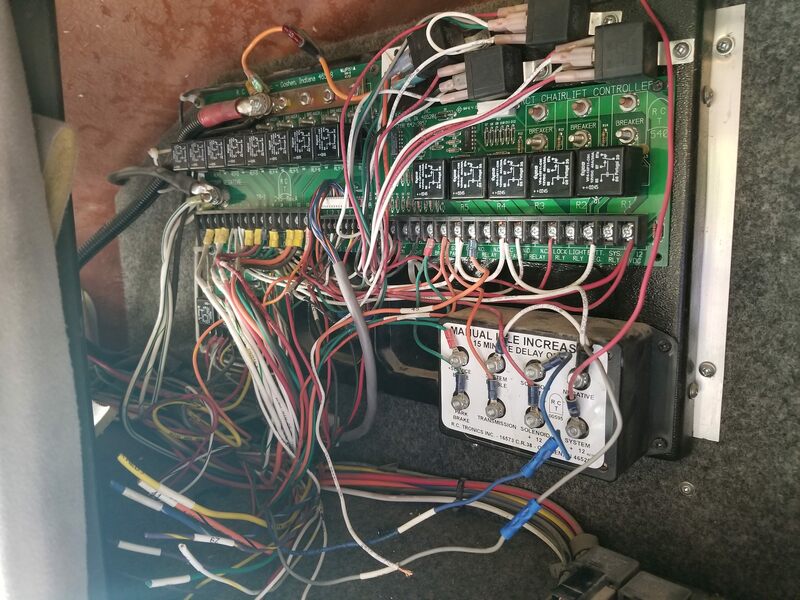 But like most old buses that have changed hands a few times, it now has hacked up wiring and a few gremlins in the electrical system. I'm good with electrical, and I have this whole 3 day weekend off with nothing to do except be bored, so I've taken on trying to straighten it out, versus him spending a lot of money for a shop to do it. So anyway.. This is a Terra Transit "Turtle Top" bus built on a 2003 E450 cutaway chassis. 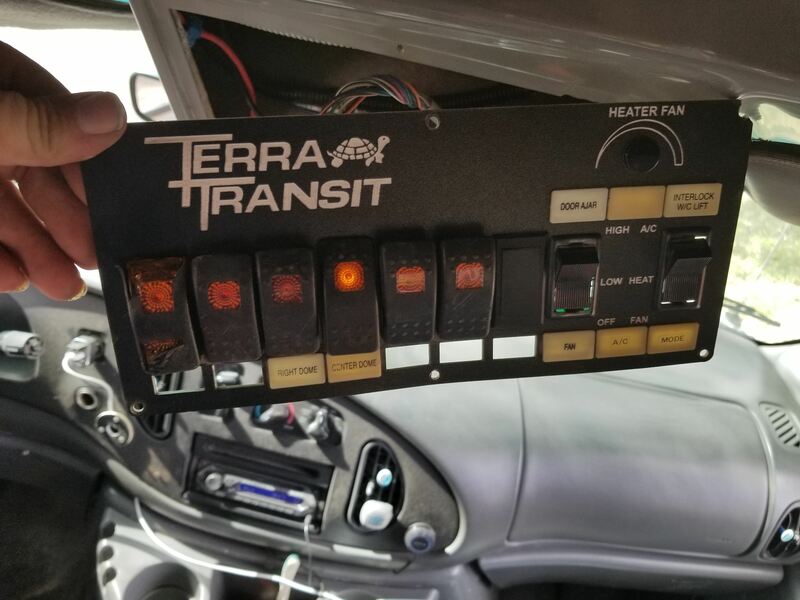 The driver's control panel has intermittent times where it just quits (the passenger lights go out and the door won't open/close). I've tried hitting the switch panel but it does not affect it. It DOES come back when I tap on the relay board itself though. Thusfar I have not been able to induce a failure by tapping on it though. While trying to decipher the add-on spaghetti, I managed to lose all power to the relay board though. It has battery feed, but the IGN feed is dead. 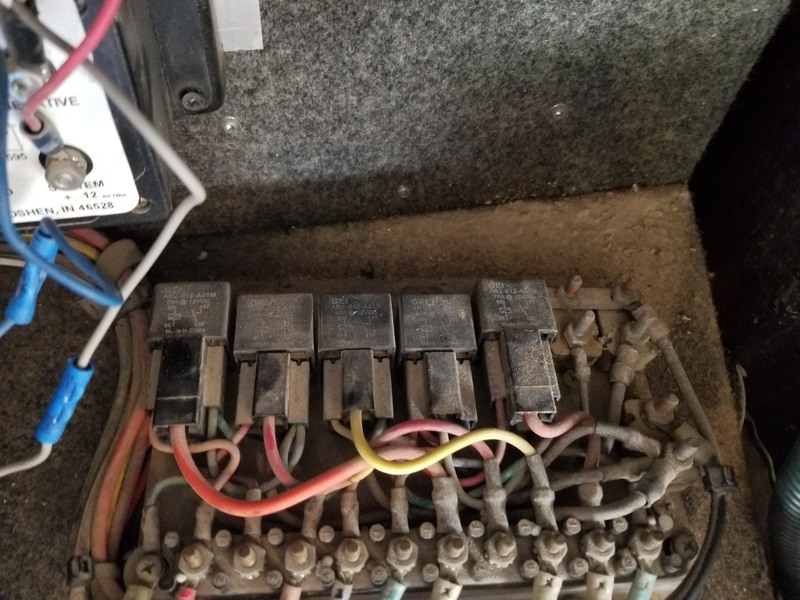 There was fused line coming from the IGN terminal on the board (fed the rear HVAC blower switch), which also had a T-tap on it. When I traced that out, I found it was T-tapped into another IGN feed that originally fed a 2-way radio.. So basically at some point the IGN feed from the cutaway harness (labeled #2 IGN/ACY POS) died, and they just hotwired it from another circuit. Genius. I also need to find out little things like why the roof hatch alarm does not work, why the red lights over the emergency exits don't work, etc. 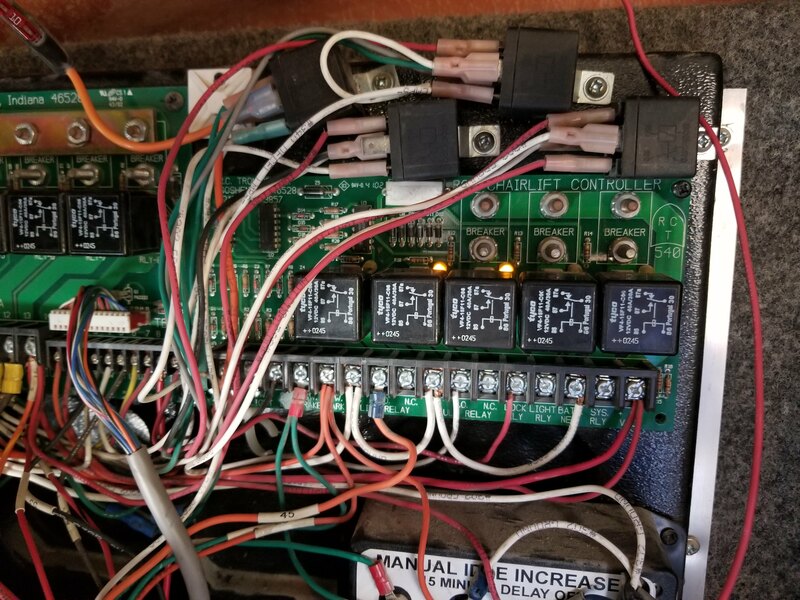 The lower power port ( the one I believe is supposed to be switched with the ignition) also does not work, and I am wondering if it is the same circuit as the IGN feed to the relay board. So does anyone have any insight? I'd really appreciate any help you can point me to. So, what are you going to do to tackle this? Diagrams don't seem to be offered so time to start from the beginning. Trace and tighten everything to restore power. Circuit board, try loosening the screws that mount the board itself. Let the board take that shape for a while and try again for the bad connection. Then tighten it all down even and see if any difference. Or take the board right off and check the other side of it. Yeah I have already made sure the terminals are tight, there was a pile of wires (8 total, no spades/rings ) on terminal 14 that I have already relocated most of elsewhere.. The lift interlock board I have already taken off and checked, the back does not look like there are any bad/broken connections but it's a double sided board and I think it's broken at the front trace. I'll have to take it off and try to reflow it from the back. But that's not really at the top of my list right now as I'm not even positive that the lift works right. I don't want to deploy it and then end up not being able to retract it lol (it's the kind that's mounted under the bus built into the stairwell). Besides, a party bus is not required to be (nor is advertised as) ADA compliant. It was just an observation when I was poking around. 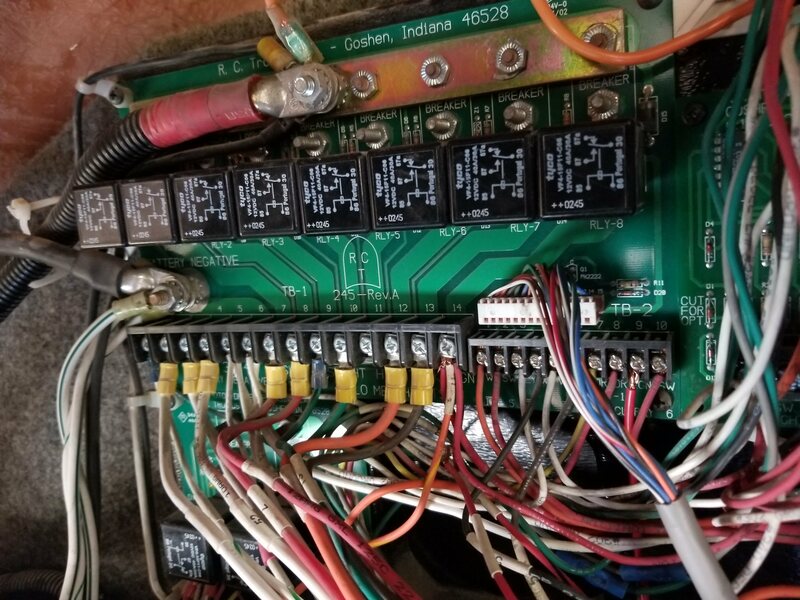 I have for the time being reconnected the IGN lead to the other circuit, but I'd like to find out why that feed in the factory harness is dead - which is why I'd like to find a diagram. I honestly find it hard to believe that there wouldn't be anything out there considering the sheer number of cutaway chassis in use.